Ziggy the Mazeman is trapped in a maze being controlled by Grumpy. 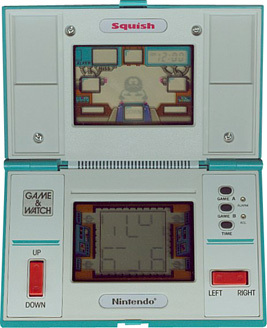 Try and stay alive for as long as you can in this Game & Watch game loosely based on Devil World. Viewed from a top-down perspective, you have to move Ziggy around the maze to avoid being crushed by the moving walls. If Ziggy is crushed between the walls then you get a miss. Three misses and the game ends. Grumpy appears on the top screen and points in four different directions, scrolling the maze. Ziggy has to move around the maze to avoid being trapped and crushed against the sides of the screen. At 80 and 90 points the maze will become more complicated (and again at 180 and 190, etc.) You score 1 point for roughly every second you remain alive in the maze. Four Maze Bugs appear in the corners of the screen. You have to navigate the moving maze and zap out all four Maze Bugs. If you fail to zap all four fast enough then ones you have already zapped will reappear. When the timer runs down to 0 then the maze changes. As you play, the maze moves faster and the Maze Bugs revive faster. You score 10 points for clearing all four Maze Bugs, and receive a Timer bonus depending on how fast you clear the game - the first phase awards up to 20 points with a further 2 points added for each phase after up to a mazimum of 50 points.